Back when I had just finished college, I was living in the remnants of a burnt down restaurant on the side of Cayuga Lake in Ithaca, New York. It was winter and I was delivering Chinese food out of my very rusty 1986 Toyota pickup truck. I’d work from 5 until 10:30, race home, sleep for an hour or so, and then go to work at an artisanal bakery and work from 1am to 9am. It was kind of brutal but like fishing, I loved the ethereal quality of the half awake world. And I loved the tactility of handling bread. We made bagels there too and I learned very quickly that there is NOTHING that tastes like a bagel that comes right out of the over. There’s about a 15 minute window and then this essence quickly dissipates irrecoverably. Toasting helps BUT that crunchy on the outside, chewy on the inside bit scrumptiousness is gone. Like the salmon, I was quite drawn to the idea of sharing this experience with friends. 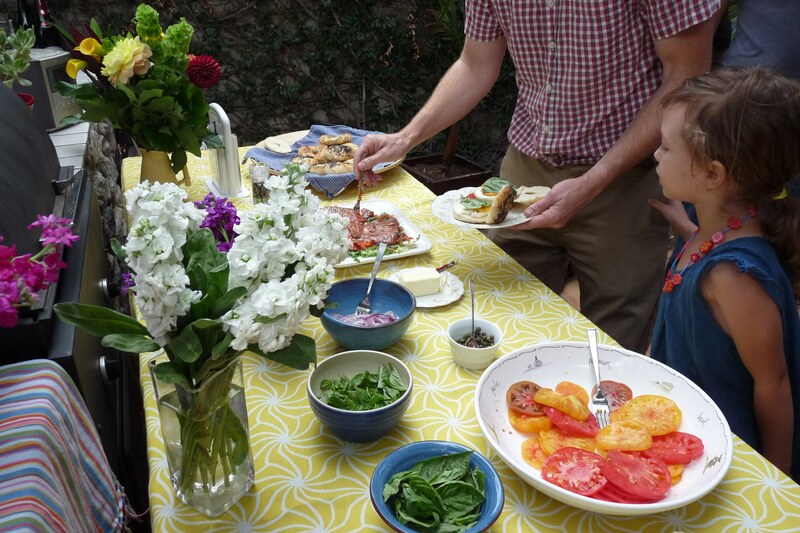 This is how the Smoked Salmon, Bagel and Champagne Party was born. 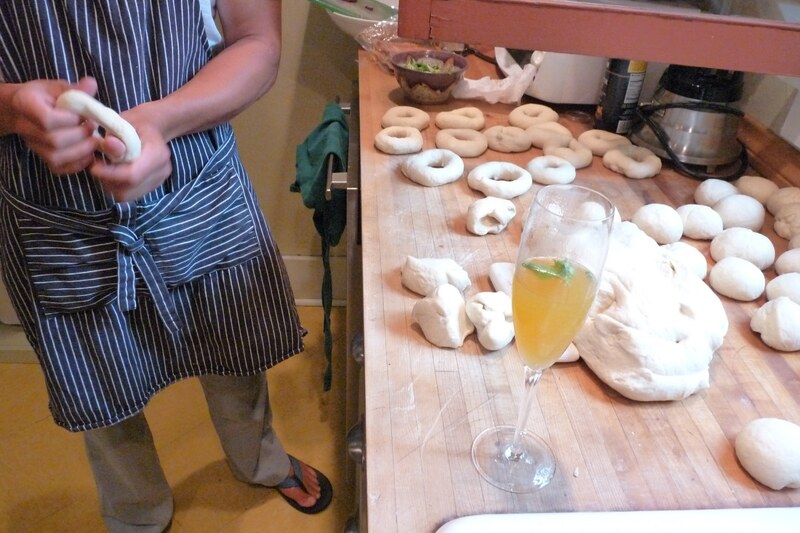 There have been a few requests from party guests for the bagel recipe and I’m happy to share. Like most things, I think that unfamiliarity is the biggest hurdle – so if you’re going to go through the steps, commit to doing it more than once as you’ll become more proficient through practice and the nuances will begin to reveal themselves. Please note that this is a two day process. I usually make and shape the dough the night before so that all I have to do in the morning is boil and then bake the bagels. It makes for a super easy morning breakfast and my guests are always kind of impressed at how easy it all appeared to be. Like most yeasted bread recipes, this is a ratio and it’s based around cups of water. I like to think of one cup of water yielding about 8 bagels… so plan accordingly. Here’s the ratio: 1 cup of water, 3 cups of flour, 1 teaspoon of salt. No matter how I multiply the recipe, I always use the same amount of yeast – about a teaspoon. 1. Put your water in a bowl and sprinkle the yeast on the surface of the water. This water should be warm to the touch – be careful though, if the water is too hot you’ll actually kill off your yeast. 2. Add flour and salt. If you’re keeping track, you’ll notice that this is more flour than most bread recipes. You’re actually going to be mixing a heavier dough. You’ll see why later. 3. Now stir until it begins to clump together. You’ll want it to be fairly stuck together before dumping it out on the counter to start kneading. Depending on how sticky it is, keep adding sprinkling flour on the counter beneath the dough as you fold it over and over. The goal here is to continually be mixing the dough to make it smooth, all the while continuing to maintain a contiguous surface on the bottom of the board. Did that make sense? More explicitly – fold the dough in half, turn it a quarter turn, fold it in half, turn it a quarter turn, fold it in half…. now repeat this about 400 times. 4. Now take a minute to scrape out the insides of the bowl and add that to your dough. Knead the scrapings into your dough and then let it rest a bit. 5. 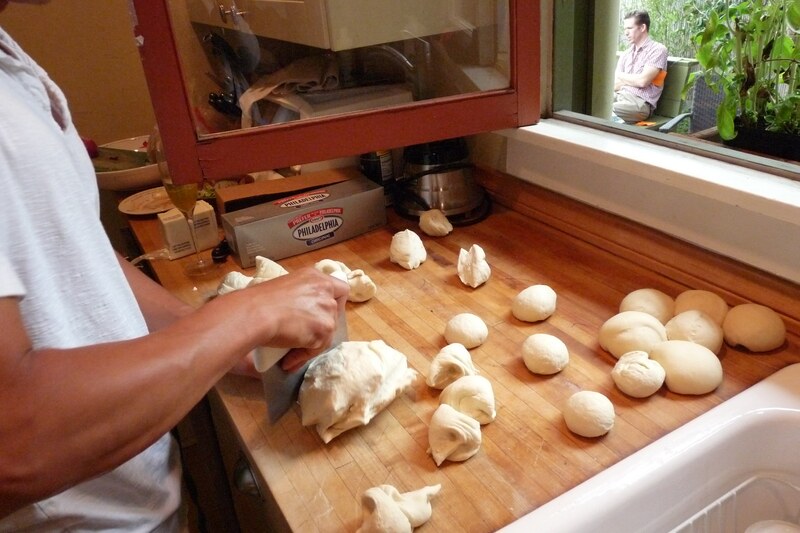 At this point, divide batch of dough into bagel size balls. I usually do this by grabbing clumps with my left hand, pulling slightly, and then using the bench scraper to cut it. 6. Shaping. Okay, this is where coordination is required and it’s VERY difficult to actually explain. So I pulled this video off of Youtube. I particularly like it because he talks about smelling the balls and shaping the balls and…well so much talk about balls – even yeasty balls! The technique this guy is using is the way to do it. When you get really good, you’ll be able to handle the balls with two hands. 7. 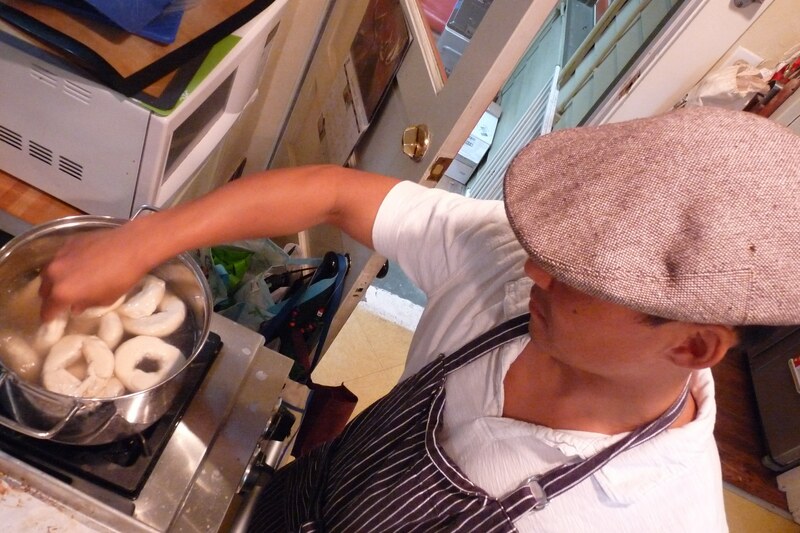 Now you’ve got your pile of balls resting on your counter and you’re ready to start shaping them into bagels. You’ll see in photo that the dough on my right have been resting a lot longer than the ones on the left. That’s why they’re kind of puffed up. You’ll find when you do this, that the dough is going to need to be a little bit relaxed in order for you to shape properly. 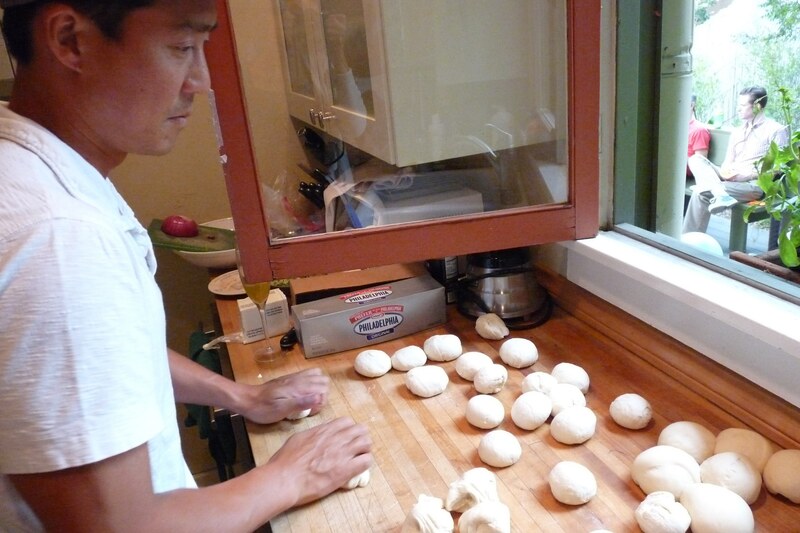 Picking up your relaxed dough ball, you want to pierce the top with your thumbs and then stick your fingers up through the bottom and roll the dough away from the center so that the seam ends up on the bottom of the bagel. After finishing, put this on a sheet of parchment paper. Now finish the batch. Cover with plastic wrap and place in the fridge over night. 8. Preheat your oven to 475. Boil about a gallon and a half of water with about a cup of sugar in there. I’ve monkeyed around with different kinds of sweeteners and have to say that sugar works pretty darn well. It gives a nice crust and also, more importantly, allows for the toppings to stick. I imagine that you could use a spray bottle with simple syrup in it to also help the toppings stick more. I never have. 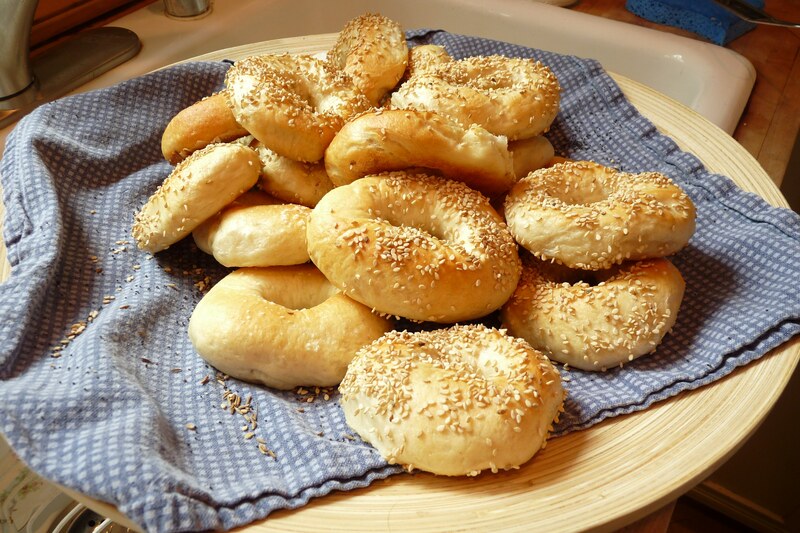 Boil the bagels for about three minutes. They’re going to want to float to the surface after about one minute. Just stick a spoon in there and turn them over once in a while to make sure everyone’s getting equal time in the pool. 9. Use a slotted spoon and remove from the water. You’ll want to put them seam side down on the parchment paper. Now you are ready to out the toppings on. Sprinkle liberally, a lot will fall off. 10. Bake these at 475 F for about 20 minutes. You’ll want to rotate after about 10. 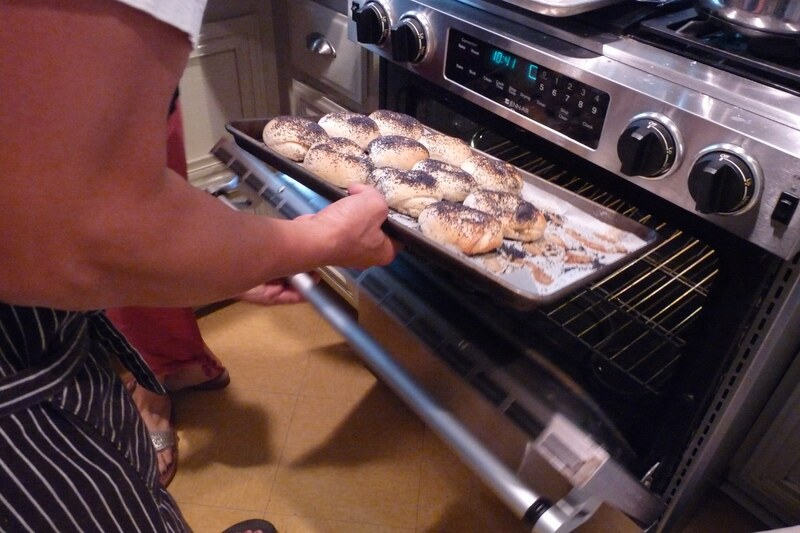 You’ll want them to be golden brown on both the top and the bottom. The Final Product. Eat 'em quick before the spirit fades. 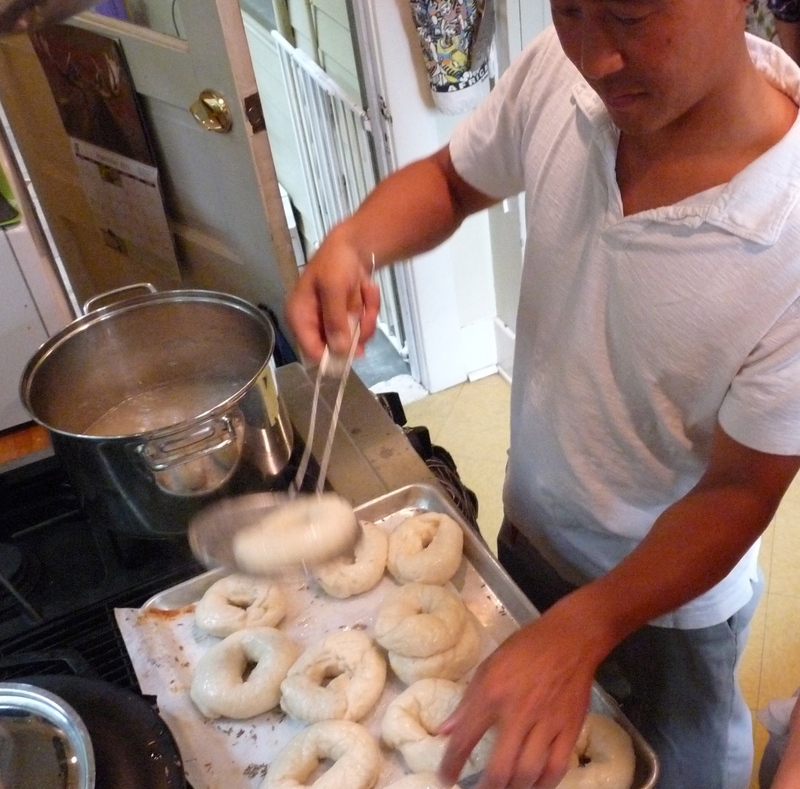 So commit to doing it more than once and now go forth and make bagels! I’m happy to troubleshoot if you have problems after your first attempt. It”ll become easier and easier with practice, I promise. it’s wonderful to see you in action, cookie. thanks for including so many pictures. i remember you teaching me this very method with the rolling of the balls. those were the days…. thanks s* – nice to have had a chance to do shippy things with you. i miss it too. structure was nice…. well…. not TOO much structure. as with everything it’s a fine balance.